Let me start by saying a big thank you to my Chromie friends, especially Jim and Denny, for their help in getting this clarified! Chrome OS encourages its users to store all their data in the cloud. This has a lot of benefits and one of them is that you can reset your Chromebook and start over without losing any data. Hence, you will occasionally see Chromebook experts recommending a reset. There are different situations where a reset is recommended. Based on the situation itself, the type of reset suggested also will vary. This is a clear sign that you need to use recovery mode to reset your Chromebook. So, if you have this message on your Chromebook, don’t panic, you can create a recovery media and get your Chromebook back to how it was when you got it. This article assumes that you have backed up anything that you have stored on your Chromebook. if you have signed into Chrome and opted to sync everything, (bookmarks, history, and passwords etc), these are stored in Google Cloud. After the reset, when you sign back in, everything should come back. Anything that you have opted not to sync, will have to be backed up manually. You will need to back up contents in the Downloads folder. These files and folders are stored locally on your Chromebook’s SSD and will be erased with Powerwash and Recovery (two types of resets that we will discuss in detail). Google Chrome that’s on your Chromebook is similar to Chrome on Windows or Mac, save for a few differences. Occasionally, the settings can get clogged up or a sly extension might take over your browser and start showing advertisements or popups on every page that you visit. Under the section “Reset,” click Reset. Power Wash is the official version of Chrome OS factory reset. In this section, I will explain how to do Power Wash and also what happens when you do it. A factory reset erases all the information on your Chromebook’s hard drive, including all the files in the Downloads folder. Remember, if you’re using a Chromebook at work or at school, you can’t reset it to factory settings. You will need to work with your Chromebook administrator (usually the IT department) to do this. One more thing. You will need to log in using the Owner Account to be able to factory reset a Chromebook. This is Google account that you used to log in to this Chromebook the very first time. Also, after the Power Wash, the Google account that you use to log in again becomes the new owner account, should you use another one. Chromebooks experts like my friends Jim and Denny will not agree when I say Power Wash is complete factory reset. Especially if you have gone into developer mode and installed Linux and additional partitions. In such situations, you need the ultimate reset, using Recovery Mode. Recovery will remove and reinstall the OS. Power Wash resets Chrome OS, the operating system on your Chromebook. It removes anything that you added to the operating system. That includes all the accounts that you signed into and everything that comes with those accounts (extensions, apps, files, and settings etc.). Recovery Mode resets your Chromebook. That means, it removes everything that was installed on your Chromebook, including Chrome OS (and everything that was part of it) and anything additional you installed, for example, your Linux partition. Inert a USB drive or SD card that you want to use as the recovery media. From the drop-down menu, select the USB drive or SD card that you connected. Click Continue and then Create now. The app will now download and copy Chrome OS into the recovery media. When the app says the recovery media is ready, remove the USB drive / SD card. Press and hold Esc + Refresh Refresh, then press Power key. Let go of Power. When a message shows on the screen, let go of the other keys too. If you have a Chromebox or Chromebit, instructions to enter recovery mode are available here. Connect the USB drive or SD card that you created recovery media on and follow the on-screen instructions. 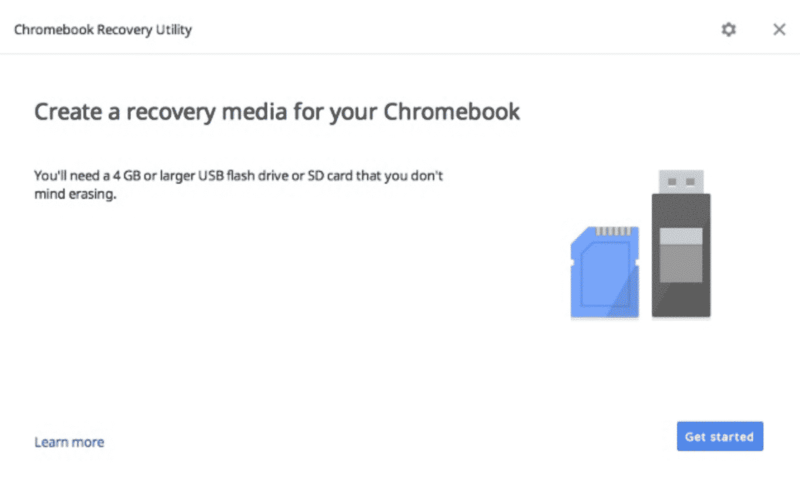 Your Chromebook will now install Chrome OS from the recovery media. When this process is complete, you can go ahead and set up your Chromebook as a new device. Remember that the first Google account that logs into the Chromebook will become the “owner account“. This reset, as the name suggests, resets your Chromebook’s hardware. Turn off your Chromebook completely. Hod down the Refresh and then press Power. Hold these two keys together for ten seconds. Now release Refresh, and then Power. The Chromebook will now restart. If it does not, press Power one more time. A bunch of other Chromebooks might need a different procedure to initiate a hardware reset. You can find them here. Those who tinker with Chrome OS to access experimental features or to install another operating system on a Chromebook would have turned the Developer Mode on. (Do not confuse this with the Developer channel, which is just a bleeding edge version of Chrome OS). Turning Developer Mode on or off resets a Chromebook.If you have the Developer Mode on, here is how to reset your Chromebook before even it completes booting up. On the “OS verification is off” message, press the SPACE key. (Normally you would press CTRL + D to skip this screen). Wait for the Chromebook to complete the reset and reboot. You will have the Chromebook reset to factory defaults when this process is over. Also, the Developer Mode will now be turned off with this process. You can always turn it back on, which will take you through another round of factory reset.